Ovronnaz offers two untagged and unsecured ski touring areas. The first is easy to access and without any particular skills; Loutze. The itineraries leave from the car park of Tourbillon (Nordic center) and finish at the Loutze bar. The second area can present a very important avalanche danger and allows to connect the region of Euloi to Dent de Morcles, through the Fenestral. This sector is joined by the use of the chairlifts of Jorasse and the Col (special fares). For safety reasons, the practice of ski touring is prohibited on the ski slopes. 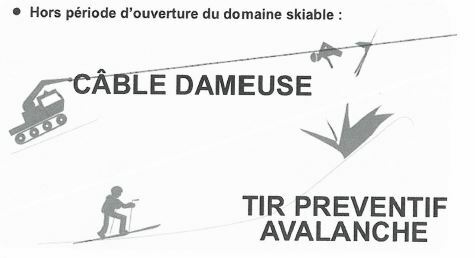 The ski tour itineraries are not protected against the dangers of the mountain (avalanches, falls, …)! After each snowfall, avalanche trips are made. It is therefore strictly forbidden for them to enter the entire ski area. The grooming of the slopes is normally done at night. The grooming machines are equipped with winches and with a steel cable that can run over a length of more than 1’000 m. These small diameter cables are not visible at night. Hikers will avoid changing on the ski area during the grooming. Anyone who takes ski touring routes is solely responsible of his own responsibility. Téléovronnaz SA declines all responsibility in the event of an accident.